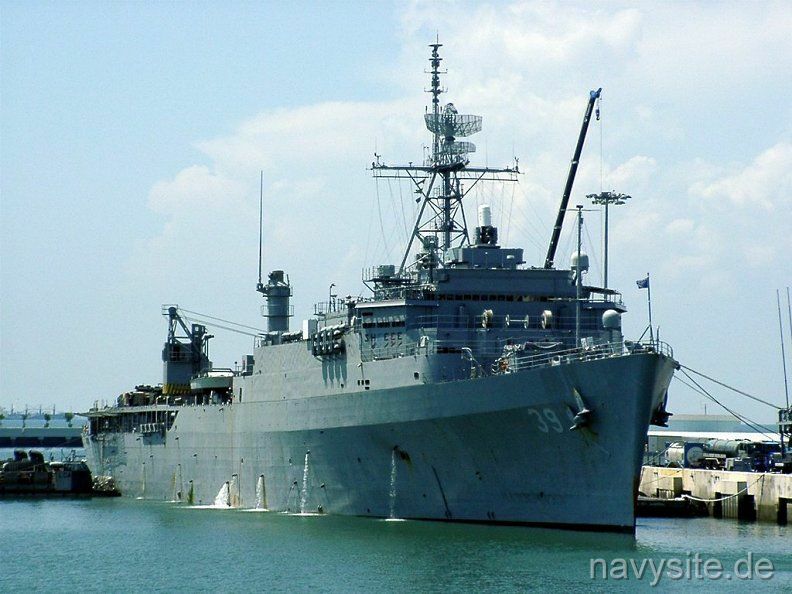 USS MOUNT VERNON was the fourth ANCHORAGE - class dock landing ship and the 5th ship in the Navy to bear the name. 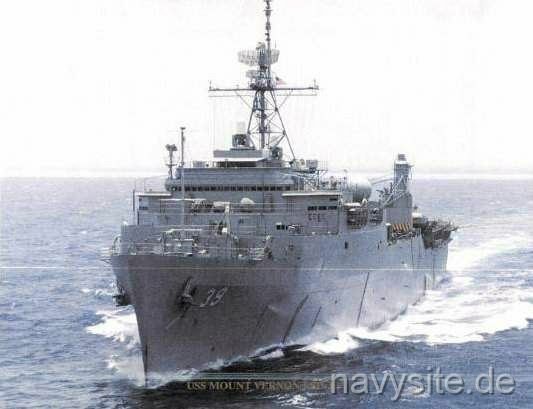 USS MOUNT VERNON was homeported in San Diego, Ca. MOUNT VERNON has completed seventeen operational deployments with the Seventh Fleet in the Far East. 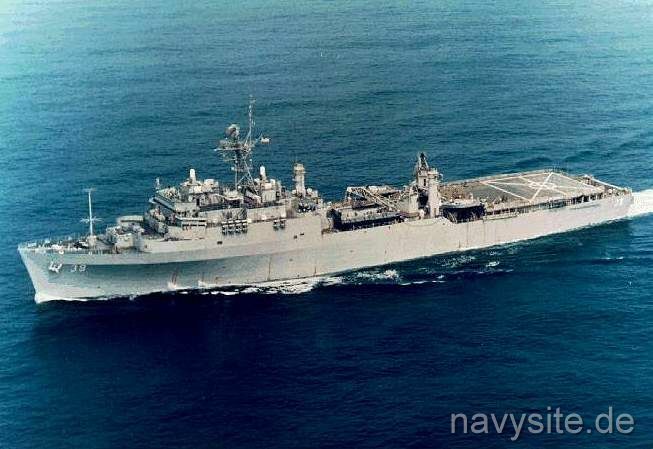 The ship was deployed with the Middle East Force for Operations in the Persian Gulf from October 10, 1987 to February 1988. In 1989, MOUNT VERNON also played an integral part coordinating clean up efforts as Control ship in the greatly publicized EXXON VALDEZ oil spill in Prince William Sound, Valdez, Alaska. 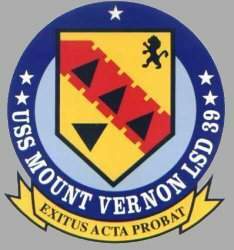 MOUNT VERNON last deployed in June of 2002 to the Persian Gulf in support of Operation ENDURING FREEDOM to include Exercises INFINITE MOONLIGHT and EAGER MACE; MOUNT VERNON also participated in humanitarian aid efforts off the coast of East Timor. Finally, MOUNT VERNON participated in Exercise NORTHERN EDGE 2003 in Valdez, Alaska. 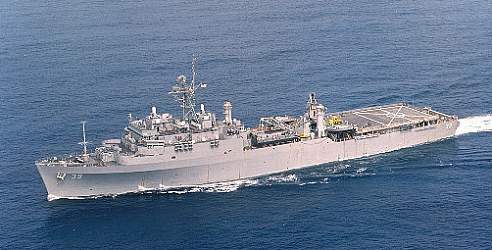 Decommissioned on July 25, 2003, the USS MOUNT VERNON was sunk as a target on June 16, 2005. Builder: General Dynamics, Quincy, Mass. This section contains the names of sailors who served aboard USS MOUNT VERNON. It is no official listing but contains the names of sailors who submitted their information. 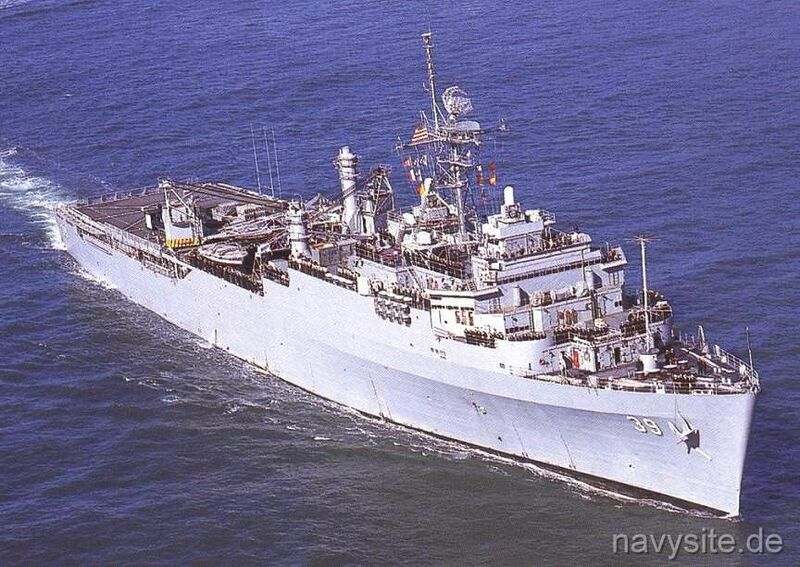 Click here to see which USS MOUNT VERNON memorabilia are currently for sale on ebay. The shield is symbolic of the MOUNT VERNON's important role in supporting the nation's defense. The large triangle represents MOUNT VERNON after discharging three LCU's, denoted by three small triangles. The area between the jaffed "embattled lines" is known in heraldry as the "fields of combat" and is shown as a field of red. 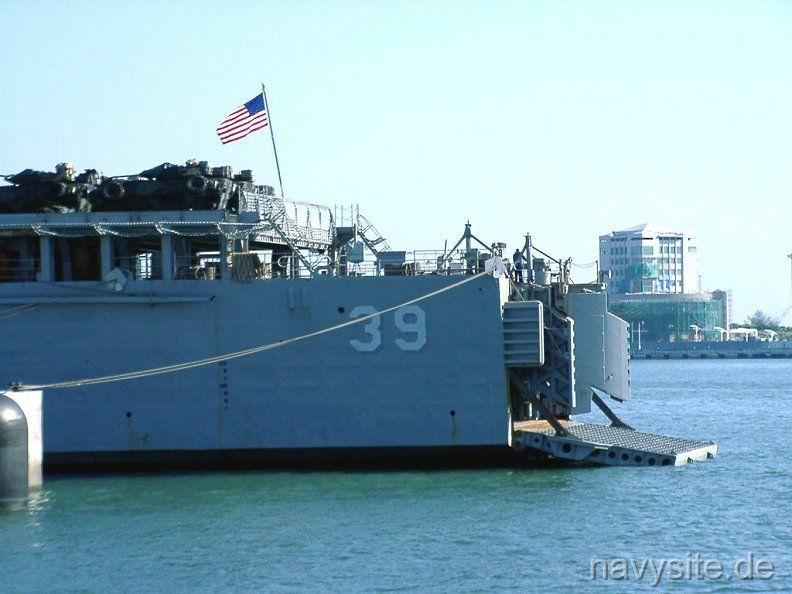 The LCU's, our main "element of combat", cross the field of combat and spearhead the amphibious assault of a hostile, foreign shore. The symbol also displays the traditional Navy colors of blue and gold. In the upper right hand corner of the shield stands the ancient mythical sea dog, one of the original amphibians, symbolizing the MOUNT VERNON's amphibious tradition. The four stars, two on either side of the ship's name, commemorate the exemplary service of the four previous US Navy ships named MOUNT VERNON. They served from the Civil War through World War I and II to face the conflicts and challenges of today. MOUNT VERNON's motto, exitus acta probat, is taken directly from the George Washington family coat of arms. This was also the motto of George Washington's home, Mount Vernon, after which the ship was named. Exitus acta probat means "action produces results." 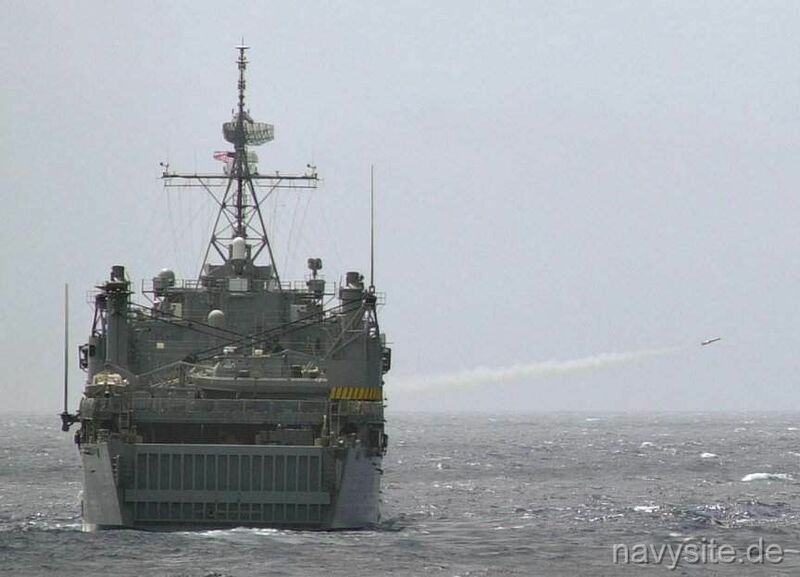 The photos below were taken in the western Pacific by Stefan Karpinski during USS MOUNT VERNON's 2002 deployment in support of Operation Enduring Freedom.